Robert Camuto, author of the wine book Corkscrewed: Adventures in the New French Wine Country is at it again; but this time it is Sicily rather than France that has attracted his attention. A Sicilian American who lives in France, Camuto is famous for seeking out the plentiful characters that dot the landscape of wine production. Camuto spends one year travelling throughout Sicily to understand the history, landscape and people that comprise this wine making region which is undergoing a renaissance of quality. Beseeched by years of abuse whether through history (two World Wars), political (the control of the mafia), or just environmental (constant risk of draught and eruptions of Mt. Etna) Sicily’s wine trade has struggled to compete in the global wine market. But Camuto discovers the locals and ‘foreigners’ (anyone not born on the isle) trying to rejuvenate the once famed wines. From the giant commercial operations trying to grow global block busters from Chardonnay and Cabernet to the small independents trying to coax taste out of rustic local varieties, readers are introduced to an entertaining and intriguing cast of characters with their own quirks and foibles. 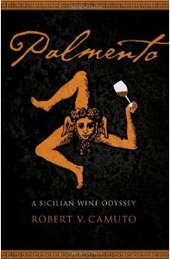 This wine book spends a significant amount of time describing the history, culture, and scenery of Sicily transplanting the reader directly into the vineyards themselves and implanting a never ending desire to see the land and experience the wines for themselves.